Since I had to work yesterday, this has been a super short weekend. Short weekends lead to BUSY Sundays. I have not been very good at meal planning lately. We’ve just been too busy and I haven’t had the time or energy to meal plan and then do a big shop on Sunday. Thankfully today I would NOT let myself off the hook. I’m tired of eating slap dash meals and this week WAS going to be different. I really enjoy making real meals for my family. I know that lots of things fall through the cracks because I work but I try to make sure that meals aren’t one of them (just don’t look at the dust!). 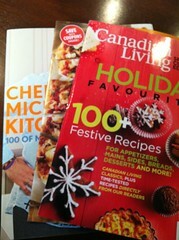 Looking through my magazines and cookbooks. So I pulled out my cookbooks and magazines, made a meal plan, made a shopping list and off I went to Walmart. Remember me telling you about Collective Bias? Well, they sent me out to shop for family meals at Walmart and come back to report on how it went. Well that’s easy since I had to shop anyway! You can see a photo story of my entire shopping trip & recipe prep over at Google+. I wanted to make something new and exciting today since I actually have time (unlike after work). I got a free All You Need Is Cheese magazine while I was at Christmas in November. I decided to try the Comforting Pan Pizza with Cheddar Cheese Curds and Parmesan. Holy! That is the longest recipe name EVER. In a large skillet, cook hamburger meat until done completely. In a small saucepan over medium heat, cook the bell pepper, water and chili sauce until the bell pepper is tender. After beef is done, add diced veggies and cook until they are soft, about 4-6 minutes. Remove from heat. In a blender, puree bell pepper mixture with the tomato paste and basil. Add to beef mixture and combine well. Preheat oven to 400 degrees. Prep 12″ cast iron skillet by spraying with cooking spray. 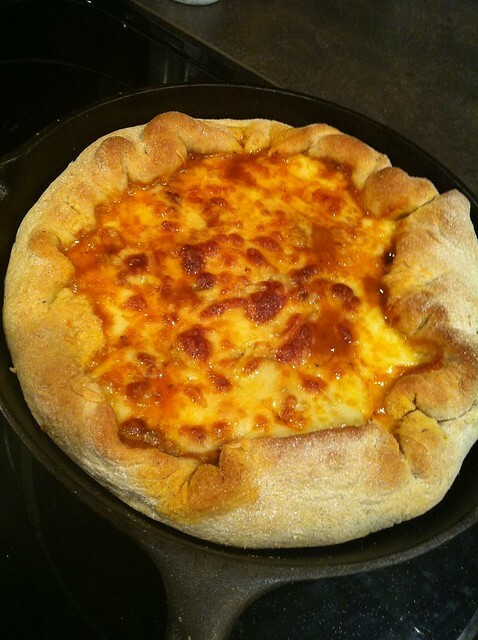 Roll out pizza dough until it is large enough to cover the bottom and sides of the cast iron skillet. Place dough inside the skillet. Make sure the dough is moulded to the bottom of the pan and that there isn’t too much excess a the top (if there is you can press it in to any thin parts on the bottom). Fill with beef mixture and top with cheese curds. 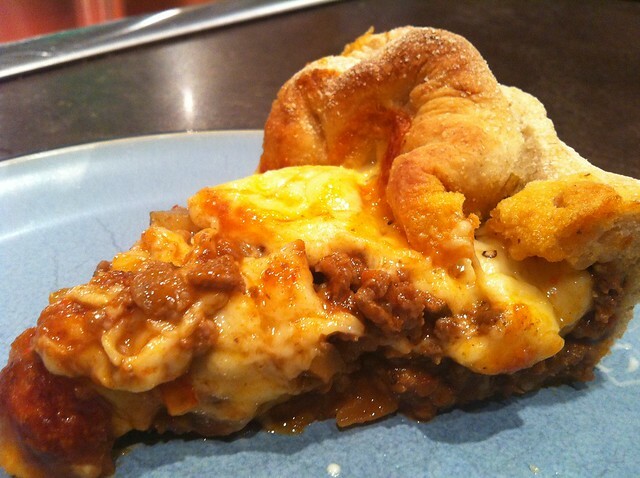 Fold any excess crust over the beef mixture. Sprinkle with parmesan and bake for 35 minutes. Let stand for 10 minutes prior to serving. The finished pizza was like molten lava when it came out of the oven! Oh my! This recipe turned out so well. Dewey and I both loved it and Evan gave it two thumbs up right before he put his head in my lap at the table and went to sleep. He has a cold and he does NOT feel well…poor guy. Evan helped make pizza crust even though he didn’t feel very good. 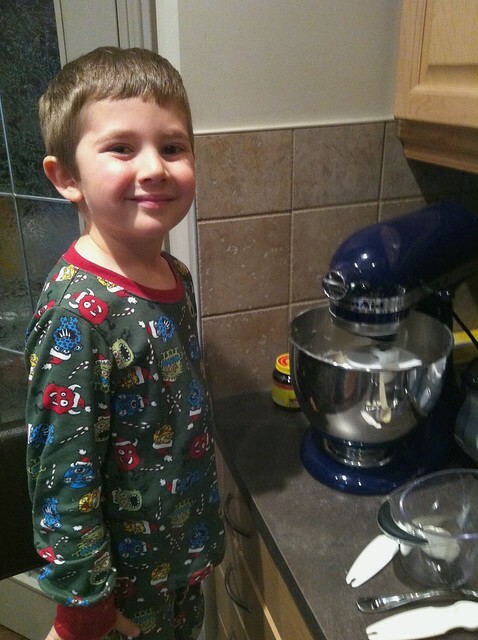 Too bad I didn’t catch a pic of the HUGE mess he made when he turned the mixer on full speed. As for the shopping…I was a little worried about going to Walmart on a Sunday afternoon because it’s usually so busy. Though the parking lot was full, I didn’t have too much trouble inside. There were a few shelves that were empty but thankfully I was able to find most of what I needed. The cashiers were backed up but a new till opened up right as I walked up so I was able to scoot right through. How lucky is that? I don’t always do my shopping at Walmart but one thing I like when I go there is that I can get a decent deal on a wide range of products. Today I needed to buy Tylenol and a humidifier for Evan because he’s sick. Had I gone to just a grocery store, I would have had to make 2 trips (or pay outlandish prices on the non-grocery items if they happened to have what I needed). It was nice to just make one stop. I find that the best ways to have a good shopping trip is to make a list before you go, do NOT go hungry and try to stick to your list. I bought a few things that weren’t on my list but not many. What are your grocery shopping tips? This shop has been compensated as part of a social shopper insights study for Collective Bias all opinions are my own. That looks delicious, btw! I will have to try it. It is really tasty. Evan and Dewey ate it and didn’t pick out even one little bit of vegetable. Win!